Each year Criterion Barrels donates more than a dozen barrel certificates to help support national and regional rifle matches held by the Civilian Marksmanship Program. This year one shooter proved so overwhelmingly dominant in National Match competition that he was awarded not one, but four barrel certificates for his performance in various CMP Games events. 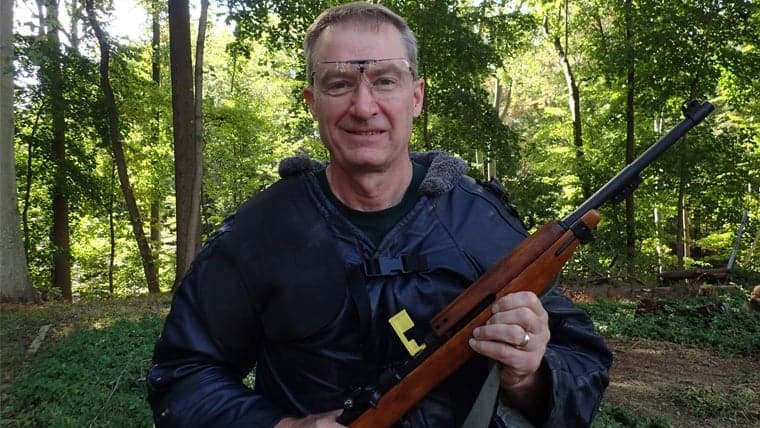 Vic Betzold had a remarkable week at Camp Perry, placing first in the John C. Garand Match, placing first in the Three-Gun Aggregate (Garand, Springfield, and Vintage Military) placing high senior in the Springfield Rifle Match, and tying for 5th place in the Vintage Sniper Match. Vic’s crowning achievement proved to be the M1 Carbine Match, where he not only placed first, but set a new national record with a score of 375-6X! We contacted Vic shortly after reading about his success in a recent CMP newsletter. While discussing the components used in each of his rifle builds, we quickly discovered that the carbine he had used during the record-setting match featured a barrel manufactured by Criterion Barrels for Fulton Armory. Vic also shot a Criterion rifle build in the Vintage Sniper and the Vintage Military Rifle Match, using both to great effect. We also learned quite a bit about his experience as a competitive shooter, a number of details describing his match rifles, and an overview of the load recipes he used during the various matches fired that week. Vic began shooting competitively in junior high school, and proceeded to shoot International Style 3 Position matches while enrolled in college at the University of Minnesota. He continued to spend a fair amount of time behind the trigger while serving on active duty and in the reserves during his tour of duty with the U.S. Army. He continued to shoot occasionally until his retirement, at which point he proceeded to further escalate his training regimen in preparation for service rifle competition. Vic tries to practice at least twice weekly in the spring and early summer before heading to Camp Perry for the national matches. As our conversation shifted toward his trip to Camp Perry earlier this summer, Vic shared some insight into the strategies and conditions he uses to his advantage on the firing line. While preparing for National Match competition at Camp Perry, participants need to plan for a wide variety of weather conditions. Shooters may encounter strong gusts of wind blowing across the shores of Lake Erie, blistering heat and humidity brought on by a hot summer sun, torrential downpours, or epidemic Mayfly hatchings of biblical proportions. Sometimes the conditions will shift from one climate type to the other within the course of a single relay. This proved to be the case during the Carbine match this summer, where various pros and cons accompanied shooters of each relay. Vic participated in the first morning relay, which was when the wind was at its lowest. The downside to this time slot was that the sun was still in the process of rising, leading to a much dimmer sight picture. The high temperatures encountered during the CMP Games this year also played a factor with shooter performance. Competitors who failed to hydrate and prepare for the heat not only shot poorly, but a few fell out as heat casualties later in the day. Vic utilized three Criterion barrels for different rifle builds over the course of the CMP Games. While quality rifle build components helped improve his performance at the national matches, time spent on the reloading bench also translated into higher scores on the firing line. For each of these three rifles Vic worked up his own unique handload recipe. Each barrel and match type requires its own preferred load, but the use of carefully selected reloading components also helped generate a greater level of consistency between cartridges. The first rifle used was a USMC M1941 sniper replica built for the Vintage Sniper Match. Vic’s sniper build was assembled by Rock Ridge Machine Works, and was purchased online through Creedmoor Sports. These rifles come standard with a parkerized Criterion 1903 barrel. Vic wound up tying for 5th place as an individual shooter in this match, scoring an impressive 197-9X. For his vintage sniper rifle build Vic assembled a load featuring 185 gr. Berger Juggernauts, Lapua .30-06 brass, IMR 4350, and Federal 210M Match Large Rifle Primers. The second build used was Vic’s M1917 Enfield, which was rebarreled with a new production Criterion barrel by Dean’s Gun Restoration. For the M1917, Vic worked up a unique load tailored to the course of fire used in the Vintage Military Rifle Match. The maximum range for the competition is only 200 yards, minimizing the potential effect of wind on the projectile. In order to lower the recoil impulse and improve his performance during the rapid fire stage of the event, Vic devised a load featuring a .30 caliber 125 gr. Sierra MatchKing. This load also incorporates H4895, Frankford Arsenal 1x fired brass, and standard CCI 200 large rifle primers. The third and final rifle featuring a Criterion barrel is the record-setting M1 Carbine featuring a chrome-lined Criterion barrel purchased and installed through Fulton Armory. Vic refers to his Saginaw carbine as the “Mystery Gun” due to the unique solutions required to get a rifle of this type to shoot accurately. Vic’s carbine load was fairly straightforward, incorporating a 110 gr. Sierra bullet, once fired Lake City brass, standard CCI 400 small rifle primers, and W296 powder. The tricky part wasn’t tied to the load development for this rifle, but in accurizing the rifle itself. Vic used an article found on the CMP Forums as the starting point for accurizing his carbine build, but soon discovered that there was no single solution for dialing in one of these handy little rifles. A good example of the debate pertains to the amount of sling tension recommended to get a carbine to fire accurately. Many shooters claim the sling should hang loosely from the carbine during the course of fire, but Vic’s carbine tended to shoot better when he applied a bit of sling pressure to help stabilize the rifle. We look forward to following Vic’s progress in future matches, and wish him the best of luck throughout the rest of his competitive shooting career. There is little doubt that a few additional Criterion barrel certificates might be heading his way if he can replicate the extreme level of skill demonstrated during the 2015 CMP Games. This entry was posted in Articles, National Records, Reviews, Shooter Testimonials and tagged .30 Carbine, Chrome Lined, Criterion Record, M1 Carbine Record, Victor Betzold.